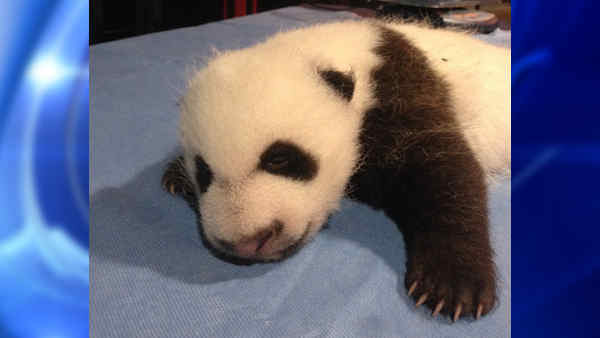 WASHINGTON -- A nearly 7-week-old giant panda cub at the Smithsonian's National Zoo has finally opened his eyes. Bei Bei now weighs 5 pounds and, from head to tail, is just shy of 14 inches long. He is also starting to develop teeth and ear canals. The cub has distinct black-and-white markings on his back that closely resemble those of his father, Tian Tian. The cub is the survivor of a set of twins. The other cub died four days after it was born. Zoo officials say the cub is sleeping through much of the day, which is normal.